Speaker cables connect the outputs of the power amplifier or the amplifier section of the receiver to the speaker. These cables carry the high-powered electrical currents required to move the internal components of the speaker (the magnets that move the drivers). Biamped: The speaker uses two separate amplifiers — one for the low-frequency drivers and one for the high-frequency drivers. Because they typically go for longer distances (especially in the case of surround speakers) and carry more electrical current than interconnects, speaker cables are considerably thicker than interconnects. The thickness of speaker cables is referred to as gauge. The lower the gauge, the thicker the conductors. You should consider cables of no higher than 16-gauge or 14-gauge thickness. For longer runs of 40 feet or more, such as runs to surround-sound speakers in a large room, try using 12-gauge cables if they fit your budget. If you want to hide your speaker cables in the wall or are running speaker cables through the wall for a multizone audio system, you need to get cables that are specially designed for this purpose and that meet electrical code requirements. You should choose cables that have been certified for this purpose by Underwriters Laboratories (UL-certified) and that meet the CL3 specification (which relates to the insulation on the wires and helps prevent fires). Pin connectors: These look like a straight or angled pin at the end of the wire. These work best with the spring-loaded clip type of speaker connectors, which you find on less expensive receivers and speakers. Pin connectors also work with the preferred five-way binding posts found on better models. 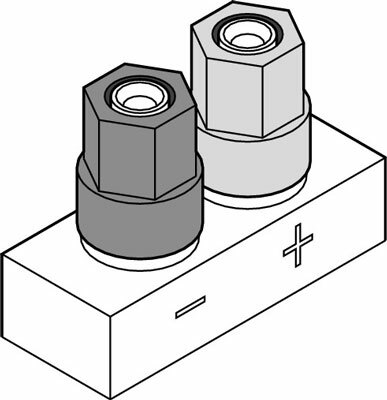 Spade lugs: These U-shaped connectors fit behind the screws on a five-way binding post. You slide the open part of the U over the post and then screw down the plastic nut. Spade lugs can provide the tightest, most reliable connection. Some spade lugs go beyond the U shape and are shaped like three-quarters of a circle, to hook around your binding post. These “hooked” connectors tend to be even more secure. Banana plugs: These plugs look like pin connectors that are fat in the middle. By bowing out in the middle, they provide a tight fit into the binding post. Banana plugs come in single and dual configurations. The dual variety is just two banana plugs (one for each wire in the pair of speaker wires) stuck together in the same housing. 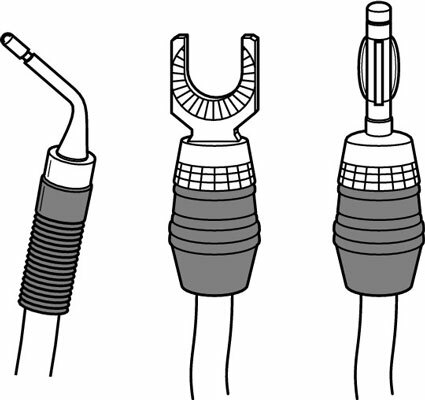 From left to right: a pin connector, a spade lug, and a banana plug. The five-way binding post (for pin connectors). Although the spade lug provides the ultimate in speaker wire connections, the banana plug provides a connection that’s very close in quality. The banana plug is also much easier to use because the banana just slides into the binding post (nothing to tighten or adjust). Your choice of speaker cable connectors is largely driven by the receiver and speaker choices you make. While ideally manufacturers would create gear that could accept any of these connectors, the real world of designing and manufacturing A/V gear often makes that difficult. When you’re purchasing speaker cables, make sure you can return the cables if they won’t fit on your gear.